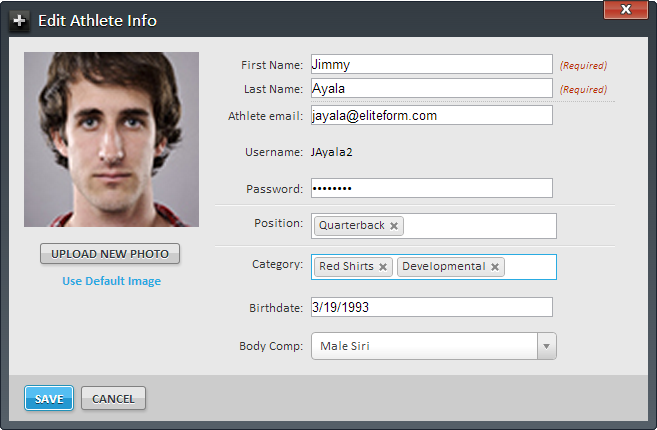 Using the Navigator, expand Athletes and enter the name of the Athlete you wish to find. Results are automatically displayed. 1. Expand the Athletes section in the Navigator. 2. Select the Season, specify the appropriate Categories and Positions, and click APPLY. 3. Any Athletes matching the specified criteria are displayed. 1. Using the Navigator, expand Athletes and click +. 2. The Add Athlete box is displayed. Specify the appropriate values. 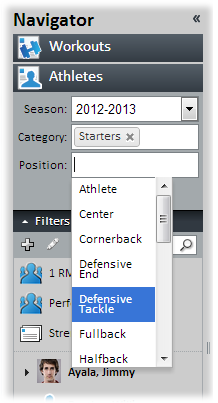 To save and create additional Athletes, click SAVE & ADD ANOTHER. To save and close the Add Athlete box, click SAVE & CLOSE. 1 – [Athlete Image] – The image or photo of the Athlete. Click UPLOAD NEW PHOTO to locate and add an image or photo of the Athlete. Clicking Use Default Image reverts the Athlete image to the default blue and white silhouette. 2 – First Name – The first name of the Athlete. 3 – Last Name – The last name of the Athlete. 4 – Athlete Email – The email address of the Athlete. 5 – Password – The password that will be used by the Athlete. 6 – Starting Season – The first Season the Athlete is eligible to participate and their Classification. More information on Seasons. More information on Classifications. 7 – Position – The position primarily played by the Athlete. More information on Positions. 8 – Category – The category of the Athlete. More information on Categories. 9 – Birthdate- The date of birth of the Athlete. Male and female variants of these methods can be selected, which enable StrengthPlanner to make the necessary calculations due to the differing body densities of males and females. 3. The new Athlete is displayed. 1. 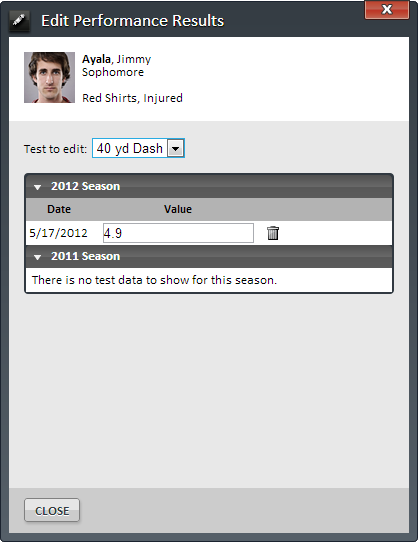 Using the Navigator, expand Athletes, and locate and select the appropriate Athlete. 2. The Athlete Performance Tests are displayed. Click or move the cursor over the Athlete’s name and click Athlete Info. 3. The Edit Athlete Info box is displayed. Modify the appropriate values and click SAVE. 1. Click Seasons from the Team Setup menu. 2. The Seasons page is displayed. 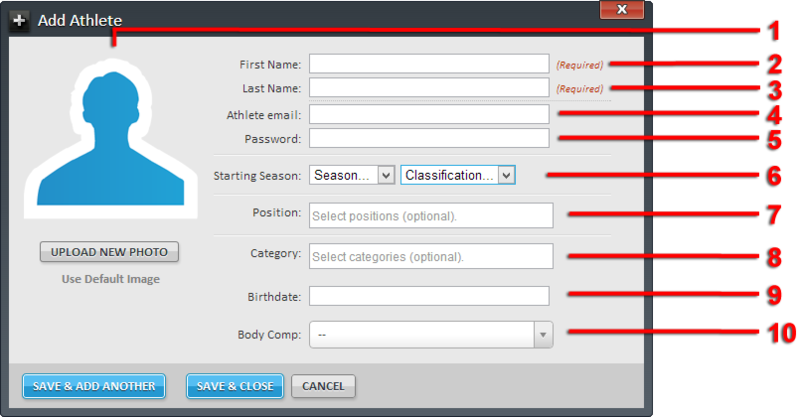 Select the Season for which the Athlete’s Classification is to be changed and click Edit on the Tool Bar. 3. The Edit Season box is displayed. 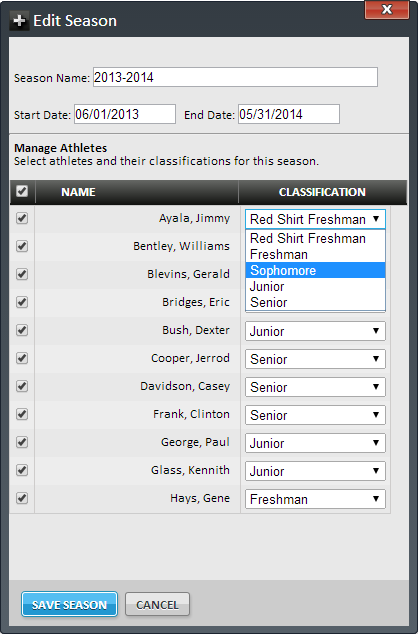 Change the Classification for the appropriate Athlete and click SAVE SEASON. When Athletes are assigned to a Workout, the appropriate strength cards are generated. 1. Ensure all changes to Sessions, Performance Stats and 1 RM Stats are complete. 2. Using the Navigator, expand Workouts, All Seasons, the appropriate Season, and the appropriate Workout. 3. The Workout is displayed. Click the STRENGTH CARDS button. 4. A list of Athletes for which strength cards are generated is displayed. If strength cards have not been generated, this list is blank. 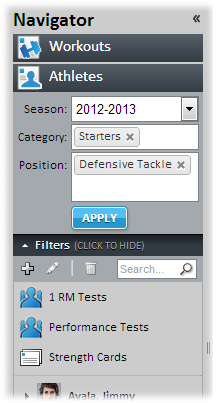 Click Assign Athlete on the Tool Bar. 5. The Assign Athlete to Workout box is displayed. Select the Athletes for which strength cards should be generated. The list of available Athletes can be filtered by specifying Categories in the ‘Show only’ box. After all appropriate Athletes are selected, click the ADD TO WORKOUT button. 6. The list of assigned Athletes is displayed. If any changes are made to Workouts, strength cards must be updated for the changes to be reflected on printed strength cards and at the rack. 1. Using the Navigator, expand Workouts, All Seasons, the appropriate Season, and the appropriate Workout. 2. The Workout is displayed. Click the STRENGTH CARDS button. 3. 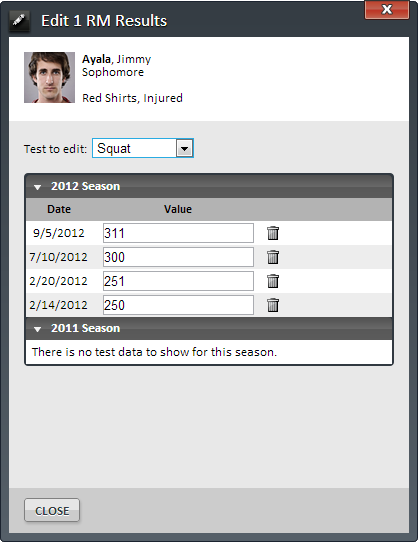 A list of Athletes for which strength cards are generated is displayed. 4. Select the Athlete(s) for which strength cards should be updated and click Update Strength Cards on the Tool Bar. 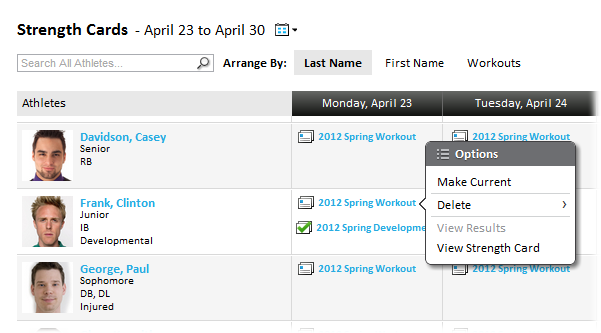 If a Workout is modified for an individual Athlete, is displayed next to their name. This indicates the strength card is modified from that of the rest of the team. In this situation, the strength card must not be updated otherwise it will be “reset” to match the Workout designed for the rest of the team. 5. The Update Strength Cards box is displayed. Select how changes should be applied and click the UPDATE STRENGTH CARDS button. Select Starting Tomorrow if changes should take effect on the following day’s strength cards. Select Starting Today if changes should take effect immediately. By default, Preserve workout sessions with results is selected. This ensures that any Workout results already recorded in StrengthPlanner for the day will be retained. If it is not selected, all workout results already recorded for that day will be deleted. 6. A progress bar is displayed while Strength Cards are being updated. 1. Ensure strength cards are up to date. 3. The Workout is displayed in the Workout Designer. 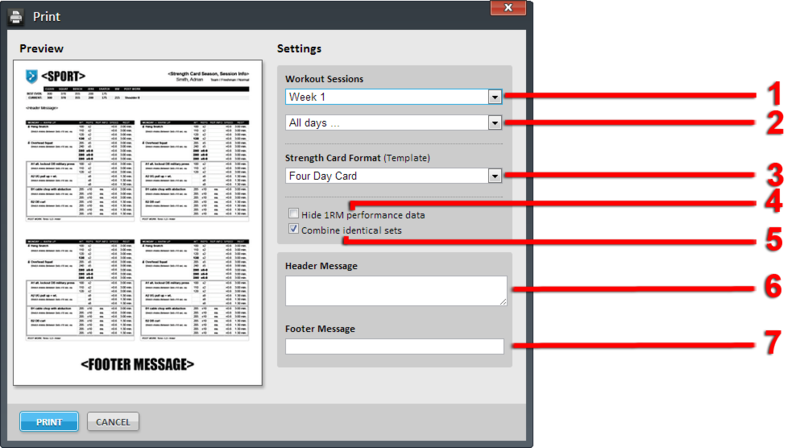 Select the Session, Week or Cycle for which strength cards should be generated and click PRINT on the Tool Bar. 4. The Print box is displayed. Specify the appropriate values and click PRINT. 1 – Week – The Week for which strength cards will be printed. 2 – Days – The day(s) for which strength cards will be printed. 3 – Strength Card Format – The format of the printed strength cards. 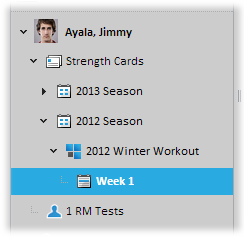 4 – Hide 1RM performance data – When selected, the 1RM section is not printed on strength cards. 5 – Combine identical sets – When selected, sets with the same number of reps and weight are condensed into a single line on strength cards. 6 – Header – The message printed near the top of strength cards. The exact location of the message may vary based on the strength card format. 7 – Footer – The message printed at the bottom of strength cards. 5. The web browser prompts you to save a PDF of the generated strength cards. Save and open the PDF. Print the strength cards using your PDF viewer’s print capabilities. 1. Using the Navigator, expand Athletes, select the appropriate Athlete, click Strength Cards, select the appropriate Season, Cycle and Week. 2. The Week is displayed. Expand the appropriate day. 3. The Exercises for the expanded day are displayed. Make the necessary changes. 1. Using the Navigator, expand Athletes and select Strength Cards. 2. The Strength Cards page is displayed. Strength Cards for the team are displayed for the current date. To change the date, click and select the appropriate date from the calendar. 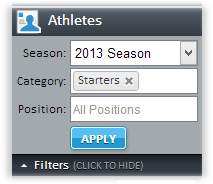 To filter the list to find a specific Athlete, enter the name in the Search All Athletes box. Results are automatically filtered as the name is entered. The list of Athletes can be arranged by Last Name, First Name, and by Workout. Make Current – Select Make Current to make the selected strength card the current card. This can only be selected if an Athlete is assigned more than one strength card for a single day. Delete – Select to delete either the Session or the entire strength card. View Results – Select to view the strength card results of the completed workout. View Strength Card – Select to view the strength card. 6 – Header – The message printed near the top of strength cards. 1. 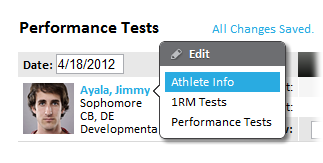 Using the Navigator, expand Athletes, select the appropriate Athlete, and click 1 RM Tests. 2. The 1 RM Tests page is displayed. Enter the new RM value in the New field for the appropriate exercise. 1. Using the Navigator, expand Athletes, and click 1 RM Tests. 2. The 1 RM Tests page is displayed. 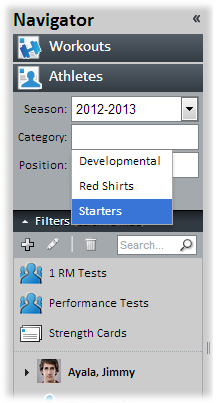 Enter new RM values in the New field for the appropriate Athletes and exercises. The list of Athletes can be arranged by Last Name, First Name, and Year in School. 1. Using the Navigator, expand Athletes, and select the appropriate Athlete. 2. The 1 RM Tests page is displayed. Mouse over the Athlete name. 3. The Edit popup is displayed. Select 1RM Tests. 4. The Edit 1 RM Results box is displayed. Select the appropriate Exercise from the Test to edit menu. The dates and the corresponding 1 RM tests are displayed. Make the appropriate changes or click to delete a 1 RM test result. After changes are made, click CLOSE. 2. The Performance Tests page is displayed. Enter the new values in the New fields under the appropriate exercises. 1. Using the Navigator, expand Athletes, and select Performance Tests. 2. The Performance Tests page is displayed. Enter new values in the New field for the appropriate Athletes and performance exercises. The list of Athletes can be sorted by Last Name, First Name, and Classification. 2. The Performance Tests page is displayed. Mouse over the Athlete name. 3. The Edit popup is displayed. Select Performance Tests. 4. The Edit Performance Results box is displayed. Select the appropriate Exercise from the Test to edit menu. The dates and the corresponding Performance tests are displayed. Make the appropriate changes or click to delete a Performance test result. 1. Using the Navigator, expand Athletes, select the appropriate Athlete, and click Body Composition. 2. Specify the appropriate Date, ensure “Values” is toggled on the far-right side of the New row, and enter the appropriate values. Height – The height of the Athlete in inches. BdWt – The weight of the Athlete in pounds. C – The Chest measurement. Tri – The Tricep measurement. SS – The Subscapular measurement. MA – The Midaxillary measurement. SI – The Suprailiac measurement. AB – The Abdominal measurement. TH – The Thigh measurement. SUM – The sum of all skinfold measurements. %BF – The percent of body fat. LM (lb) – The amount of lean mass in pounds. Fat (lb) – The amount of fat mass in pounds. ∆ BdWt – The change in body weight. ∆ % – The change in body fat percentage. ∆ LM (lb) – The change in lean mass in pounds. ∆ LM (lb) – The change in fat mass in pounds. 1. Using the Navigator, expand Athletes, and click Body Compositions. 2. Expand Filters and specify the Season, Category, and Position to refine the list of Athletes for which you want to export body composition data. 3. The list of Athletes meeting the specified Filter criteria is displayed. Click the Export button. 4. The “Body Compositions.xlsx” file is downloaded. 2. Select the appropriate date and click Delete. 3. The Delete Body Compositions box is displayed. Click YES.